Joey White Fusion Paper Bags 25 Pk 10x5x10"
Joey size White Fusion Recycled Kraft Paper Shopping Bags by the 25-Pack are white on the outside and brown on the inside. They are made of 60# paper weight from 100% recycled paper - 95% post consumer. A Green Way ® - Packaging with Purpose brand product. Made in the USA. 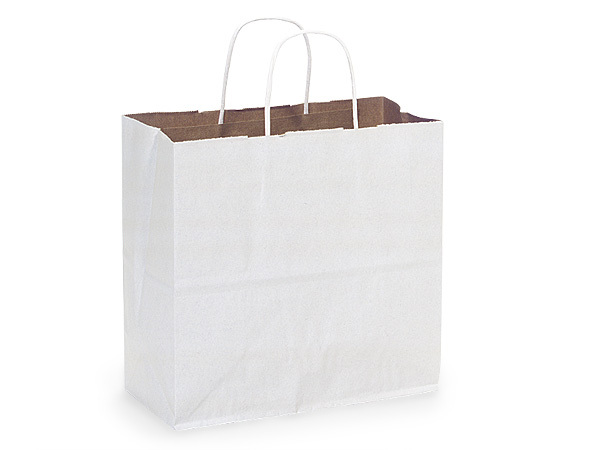 These paper shopping bags are a fusion of white and brown kraft paper, with the white showing on the outside of the bags and natural brown kraft on the inside. You can easily dress up these bags for any occasion with our printed tissue paper! We offer these bags in small, medium, large and jumbo sizes, with an assortment of sizes available! All of our fusion paper shopping bags contain a minimum of 40% post-consumer recycled and proudly Made in the USA!